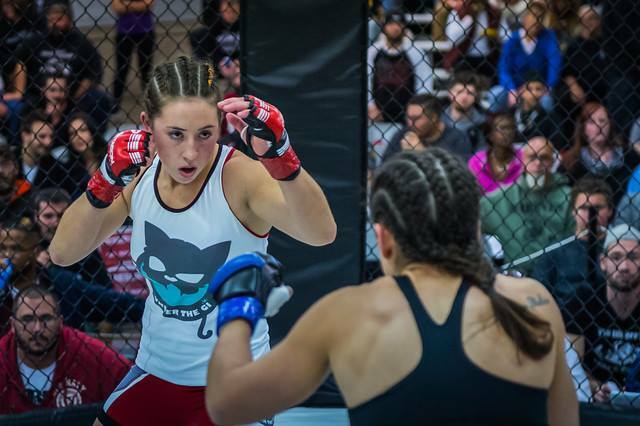 Gemma Sheehan started in the sport of MMA at age 13. For 9 years she pursued professional fighting and was rising as a top Canadian competitor, with a record of 5 wins, 1 loss, 4 wins in the first round. She took the gold at the 2016 Pan-Ams for Brazilian Jiu Jitsu, and was ranked the #1 MMA fighter in Ontario the same year. In 2017, Gemma decided to end her fighting career, and she started a company called Girls Who Fight that offers self defense and mixed martial arts classes and workshops to girls in Toronto, and to schools and organizations. Aside from growing the business, Gemma volunteered in South Africa for three weeks in May, teaching self defense to kids and women living in the township of Khayletshia - which has some of the highest rates of violence and crime in the world. Outside of fighting and teaching, Gemma loves her two dogs, playing squash, and long walks to the all you can eat sushi restaurant!